Kachori is a spicy snack from India ; popular in other parts of South Asia. It is also common in places with South Asian diaspora such as Trinidad and Toabgom Guyana and Suriname. Alternative names for the snack include Kachauri, Kachodi and Katchuri. Kachoris have been popular in old Delhi and Kota, Rajasthan even before Samosas gained popularity after the partition. Banarasidas, the author of biographical Ardhakathanaka, has mentioned buying Kachoris in Agra in 1613. For seven months, he bought a ser of Kachoris daily, and owed twenty rupees. Kachori is supposed to have originated in Uttar Pradesh and Rajesthan. In these states it is usually a round flattened ball made of fine flour filled with a stuffing of baked mixture of yellow Moong dal or Urad dal (crushed and washed horse beans), besan (crushed and washed, gram flour), black pepper, red chili powder and other spices.Additionally in Rajasthani Cuisin, the Pyaaj Kachori (onion kachori) is very famous. Another popular form of Kachori in Jodhpur is the Mawa Kachori invented by Late Rawat mal ji Deora. It is a sweet dish dipped in sugar syrup. I intend to master that recipe some day and post it as it is one of my very fond memory of my childhood when I was in Neemach, one of the neighbor we used to call her "Bhabhoo Sha", who was from Jodhpur, she used to make these for us, I still remember that taste and will surely will try to replicate that recipe. In Gujrat, it is usually a round ball made of flour and dough filled with a stuffing of yellow moong dal, black pepper, red chili powder, and ginger paste. In Delhi it is often served as chaat. Delhi also has another kind of kachori, called 'Khasta kachori' or 'Raj Kachori'. A variant includes sweet upwas (fast) kachori, made with potato, coconut, and sugar. Kachoris are often served with a chutney made from tamarind, mint, or coriander. Another type is fried and stuffed with pulses (urad and moong especially) and is generally found in the Kutch region of Gujarat. A kachori stuffed with peas is a delicacy in Bengal. Some of the variants popular in North India include a version similar to the Rajasthani one, accompanied by a curry made of potatoes and varied spices or even chana (chole) similar to one served in Chole Bhatura. I have been thinking of making the Kachori stuffed with Chana dal and I finally made it, I did not want to make it very doughy so rolled it little thinner and bigger, but if you like you can make small size so the outer crust is more doughy. Only thing is you have to fry it patiently in order to get perfectly cooked flaky outer layer. Wash and soak dal for 3 hours. Mix the ghee in to flour with palms of your hand. Gradually add water to make dough. Knead the dough for 3-4 min. Cover with wet cloth and cover and set aside. Mix and Roast above in a wok on low heat for 3 min stirring constantly. You can adjust the amount of above spices to your taste. When light brown, turn the heat off and let them cool. In a food processor add following with soaked and drained dal. When oil is hot add cumin seeds. Add salt and all the spices. Add water and cook in microwave covered for 5 min stirring in between until dal mix is wet but thick enough to be made in to balls. 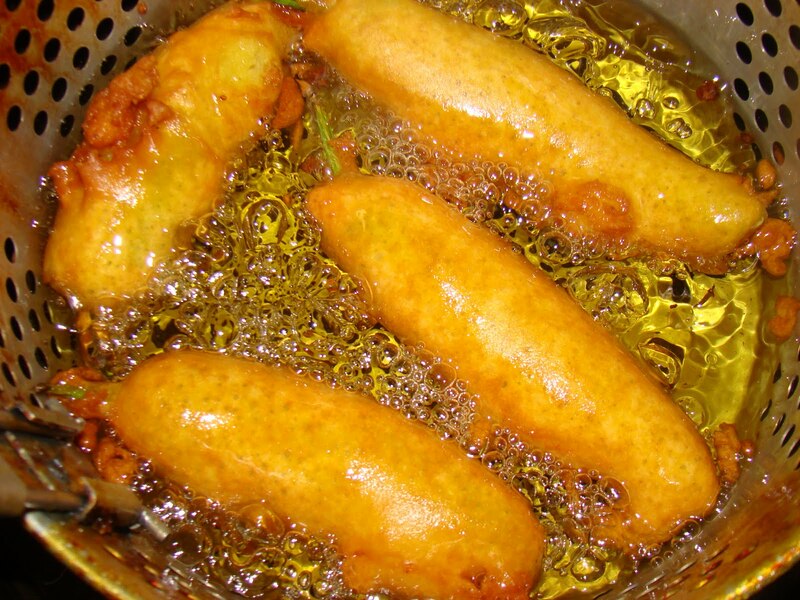 Heat oil in fryer, add shortening (I usually mix oil and shortening, you can use one or other. While oil is heating in fryer, knead the dough and divide it in to 10-11 golf ball size balls. Divide the stuffing in same number and set aside. Roll the dough in to 4" circle. Place the stuffing on the rolled dough in the middle. Fold it like shown in picture. Now at this point you and roll the stuffed ball in to rice flour and further roll it in to 3-5 inch circle or you can press with your hand to flatten the disc if you want the Kachori to be with thick outer layer, I prefer thin outer layer of dough so I further rolled it. Deep fry on medium heat at 375 degrees for 5-6 min each turning it in between until Kachori is light brown. Place the Kachori to drain on paper towel. I made few with thick outer layer of dough as you can see in pictures. Choice is yours. Repeat the process until all the Kachoris are done. Cilantro Mint Chutney, Tamarind Chutney, yogurt, and Garlic chutney (recipes on this blog) serve this with . Chopped onions and cilantro and chopped fresh Serrano peppers if desired. You can sprinkle chat masala or roasted cumin powder on top.